Huawei held its 15th annual Global Analyst Summit today in Shenzhen, China. At the summit, Huawei shared its vision for an intelligent world of the future, as well as the trillions of dollars of new opportunities that will come along with it. Huawei was joined by more than 500 analysts, key opinion leaders, and media representatives across a range of industries, including telecoms, Internet, and finance. 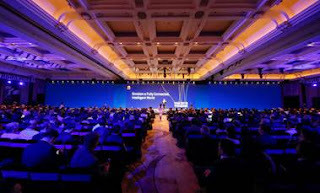 Huawei shared its new vision and mission during the morning session: "Bring digital to every person, home and organization for a fully connected, intelligent world". Company executives elaborated on Huawei's role as a pioneer of this intelligent world, giving insight into company strategy and current initiatives. As a glimpse of what the intelligent world will entail, Huawei released the Global Industry Vision 2025 report, which outlines business practices, solutions, and technological innovations in artificial intelligence (AI), 5G, cloud services, the Internet of Things (IoT), and other domains. Huawei Rotating Chairman, Eric Xu, opened the summit, explaining Huawei's new vision in detail. He talked about the benefits of digital and AI technology for every person, home, and organization, as well as the challenges the industry faces. "In an age defined by greatness, Huawei aspires to become a great company. We want to help mankind take its next step forward," he said. "This is the basis of our new vision and mission: Bring digital to every person, home and organization for a fully connected, intelligent world." Guided by its new vision, Huawei will trailblaze a path forward to this intelligent world, focusing on ICT infrastructure and smart devices. Huawei aims to increase the competitiveness of its entire product and solution portfolio – including cloud, networks, and devices – and deliver a superior user experience through across-the-board adoption of AI technology. Eric Xu concluded his keynote with a teaser about the full-stack, all-scenario AI solutions Huawei will release at the upcoming HUAWEI CONNECT conference to be held in Shanghai later this year. William Xu, Director of the Board and Chief Strategy Marketing Officer of Huawei, followed with a release of Huawei's Global Industry Vision (GIV) 2025. The GIV is a new report in which Huawei offers insight into global ICT trends and lays out the blueprint for the ICT industry. They predict that, by 2025, the total number of connections around the world will reach 100 billion, video will account for 89% of total data traffic, and 86% of global companies will adopt AI, creating a digital economy worth US$23 trillion. William Xu noted, "Through nonstop innovation, Huawei will unfold the blueprint for industry development, and enable all sectors to take part in a fully connected, intelligent world. We will team up with our global partners to make this world a reality." David Wang, Huawei Executive Director of the Board, President of Products & Solutions, spoke on innovation. "Innovation is key to the intelligent world," he said. "Huawei's product and solution strategy centers around three concepts: All Connected, All Cloud, and All Intelligent. Based on these, we will continue to push forward with business and technology innovation across a range of enabling sectors like AI, 5G, cloud services, and IoT. We will build more open technological architecture and adopt a more open business model, working with customers and partners along the entire value chain to grow the industry and drive the development of digital economy. Together, we aim to build a fully connected, intelligent world."